PASIG CITY, Philippines- Do you have high blood pressure? Do you, like most people, think that high blood pressure is something that you will have to live with for the rest of your life? “And when you have a lot of phlegm in your lungs,” he says, “this will affect the amount of oxygen that goes into the blood and can be used by your body. The lack of oxygen will affect the functioning of your organ systems, including your digestive system. This results in unprocessed food and toxins which go into your blood and cause high blood pressure. “The harder part, however, is getting your blood pressure to remain normal after your Hilot healing program,” says Dr. Fajardo. Can anybody have Hilot for high blood pressure? This is a question we are often asked, because there are people who would like to experience Hilot, but are worried because they have heard massage is bad for those with high blood pressure. 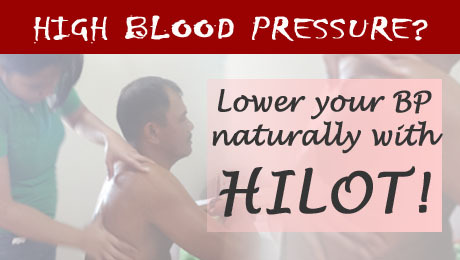 Do you want to try Hilot to lower your blood pressure? “If you choose to try traditional Hilot to address high blood pressure,” Dr. Fajardo reminds, “be sure to seek out a skilled, knowledgeable, experienced, and reputable practitioner or group who specializes in traditional Hilot healing, like the Association of Traditional Health Aid Givers Philippines, Inc. (ATHAG). (0933) 810 0014 or (0905) 415 7087 to set an appointment with him. Thank you!